In #MittenTrip, East Michigan, Southeast Michigan. There are definitely ways to explore the great outdoors in Detroit, but there’s nothing quite like the quiet of being “up north.” That experience is true for where I hail from (Traverse City), and it is absolutely true for the tip of the thumb. While on a #MittenTrip in Port Austin, I took my adventures seriously and was not disappointed in the least. I need to extend a special thanks to Port Austin Kayak who made sure I had a bike to ride and a kayak to paddle, but the owner, Chris Boyle, didn’t stop there: he had plenty of maps, advice, and enthusiasm. There are tons of places to go biking in Port Austin and the surrounding areas. I was convinced that I wanted to ride my bike to Grindstone General Store and indulge in their giant ice cream cones (see: Port Austin #MittenTrip Guide), but Boyle was gracious enough to offer me many different biking maps. I had so many options! The chosen route was a 10ish mile round trip to Port Crescent State Park Day Use Unit; the map was riddled with clues of places to find picturesque views, hiking trails, and swimming spots. I decided to leave mid-morning to beat the heat of the day while still being able to revel in the beautiful sunshine. Equipped with my rental bike and my helmet adorned with a Great Lakes Proud sticker, I was off on a pedal out of town and into the quiet of the countryside. The map recommended taking Sand Road at Gallup Park where I went through quiet residential areas that led to a dirt road. Once the pavement ended, I was surrounded by lovely homes, agricultural fields, horses and cows milling around, and barns spotting the horizon. During my ride down this particular road, I only passed two people running and three cars – talk about peaceful! Sand Road dead-ends at Port Crescent Road, so I took a right where I found the Port Crescent Cemetery. Boyle promised this to be a neat place to rest and take pictures. Walking down the path toward the rolling hills of the old cemetery felt like entering another world. I instantly felt transported to a quieter, simpler time. It was an opportune time to visit because graves were adorned with flags and flowers to honor the history of those buried there. Trail access. Photo by Joanna Dueweke. Jumping back on my bike for a quick jaunt down Port Crescent Road, I arrived quickly at a trail access just across Port Austin Road, or M-25. I rested my bike by the trail’s parking lot because bikes aren’t allowed on the trail, and I ventured across the footbridge toward the trail’s map. There were a couple different options for directions to take, but I decided to head toward the water. After a short and manageable hike through the woods, I came upon a sand dune that led down to where the Pinnebog River meets Saginaw Bay and Lake Huron. The views were worth the sweat I broke during the walk, and I felt like I had discovered a secret. Pinnebog River meets Saginaw Bay. Photo by Joanna Dueweke. Following the walk back through the trails, I followed M-25 toward the Port Crescent State Park Day Use Unit. If I had continued on a bit and gone down Loosemore Road, I would have been able to explore the Huron County Nature Center but I wasn’t feeling that ambitious. The State Park had plenty of areas to ride my bike, rest, dunes to climb, and beaches to kick myself for not packing my suit in order to properly enjoy. After I felt ready to make the long haul back to Port Austin, I climbed back on my bike re-energized. For the ride back, Boyle said to either follow the route I had taken to get there, or ride along M-25. I chose to be a little more adventurous and travel the road I hadn’t yet. There were a couple places to stop for water and snacks along the way (I forgot water, don’t do that! ), and if you were particularly hungry, there were a couple restaurants. One of my favorite things was the roadside park that had beach access as well as places to take care of other human needs. The ride was easy enough along the highway because the shoulder was wide and there weren’t a ton of hills. I wasn’t up for another big bike ride, so I drove the route to Grindstone City that Port Austin Kayak recommended. If you’re feeling really ambitious, I recommend doing it by bike. Eagle Bay, the jetty by Captain Morgan’s Grindstone Bar & Grill, and the roads leading to Grindstone General Store were perfect for exploration, pictures, and relaxation. Turnip Rock, Port Austin. Photo by Joanna Dueweke. understand that the Huron County Nature Center is worth the effort as well – it’s on my list for my next visit to Port Austin. 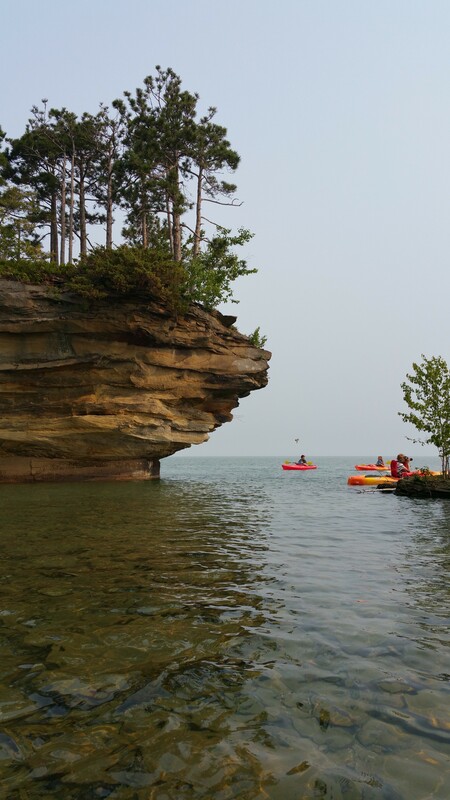 My other adventures while in Port Austin consisted of a life-altering kayak trip out to Turnip Rock, stay tuned for more detail about that aspect of the #MittenTrip. What are your favorite biking and hiking adventures to take in Port Austin and Huron County? Tagged Biking, Eagle Bay, Great Lakes Proud, Grindstone General Store, hiking, kayaking, mittentrip, Pinnebog River, Port Austin, Port Austin Kayak, Port Crescent State Park, Saginaw Bay.